Can a Divorce Be Pending in Two States? It is possible for a divorce to be pending in two states at once. This can occur when a husband and wife live in separate states and each of them files for divorce in their home state at around the same time. When a divorce is pending in two states, it complicates the process and can extend the length of time it takes for the divorce to finalize. Also, even though a divorce can be pending in two states, only one state can issue the final divorce judgment and this would terminate the case in the other state. Before you can file for divorce in any state, you must establish residency there. Each state has different residency requirements for divorce which tell you how long you must live in the state before you can file your complaint. For example, in Connecticut, Maryland and New Jersey you must live in the state for at least one year before you may file for divorce. In Texas, Virginia and Mississippi, you need to live in the state for at least six months before filing for divorce. Some states have much shorter residency requirements. For example, Arkansas has a 60-day residency requirement. Finally, Alaska, Louisiana and South Dakota do not have a minimum residency period; you simply need to live in the state at the time you file for divorce. Oftentimes, couples will live separate from one another — sometimes in different states — while still married. If each partner establishes residency in a separate state, this can lead to what is known as forum shopping. Forum shopping occurs when a person looks for and files their court petition in a jurisdiction perceived to be more favorable to their case. For example, a husband lives in California and a wife lives in Washington. If the husband wants to divorce his wife, he has the option of filing a complaint in either state. If the husband does not want to pay as much alimony, he can research the laws of each state and file in the one that is less likely to grant a high alimony award. By doing this, the husband is forum shopping for the best state in which to bring his case. If you and your spouse each file for divorce around the same time in different states, this can complicate the divorce process. Each state would need to establish jurisdiction over the spouse that lives in the other state. Jurisdiction may be easily established if your spouse routinely travels into your state and you personally serve her while she's there or she voluntarily agrees to be under the jurisdiction of your state. However, if your spouse refuses to come to your state, the court will need to review a series of factors to determine if jurisdiction is proper. The more connections your spouse has to your state, the more likely the court will be able to assert jurisdiction over her. For example, if your spouse works in your state, owns property there or frequently travels to it, jurisdiction may be proper. However, if you live in a state your spouse has no connection to, rarely travels to and has no family or property there, jurisdiction will be difficult. If your spouse does not want to be under the jurisdiction of your state, he can try to avoid service in several ways. Since personally appearing in the state will likely make your spouse susceptible to jurisdiction, he may actively avoid being served there. He may also refuse to sign any paperwork or send correspondence to the court in your state so he will not have to participate in the divorce process. If your spouse owns property in your state, he may transfer the title to a friend or family member. If he works in your state or travels there on business, he may try to change his schedule or habits. This is why it can be a difficult process when spouses file for divorce in different states. If a husband and wife each file for divorce at the same time and both parties are properly served, the divorce will technically be pending in two different states. If the parties cannot agree on which state will handle the issues of their divorce, the courts will make this determination for them. Either state can hear the case with respect to where the divorce should be handled. Courts will look at various factors, such as where the parties lived during the marriage, where their children live and attend school, where marital property is located, how property is titled and where each party works. The court will then make a ruling as to which state has jurisdiction; once established, the divorce action will proceed in the state with jurisdiction and be withdrawn from the state that does not. If two separate states have jurisdiction over both parties to a divorce and each spouse files for divorce simultaneously, the divorce will be pending in both states at once. However, only one state can issue a final judgment of divorce. 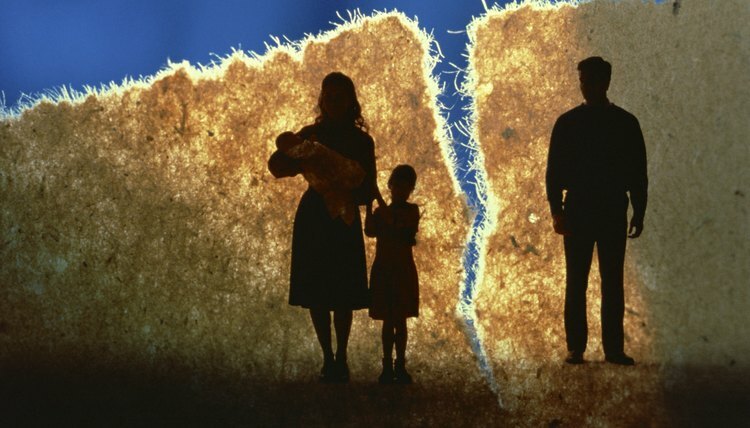 In some situations, a state may enter a default divorce against one person. If that happens, the court will have exercised its authority to dissolve the marriage itself, but likely did not deal with any or all outstanding marital issues, such as property division, alimony or child custody and support. This is called a status-only divorce. Once this occurs, the other state cannot divorce the parties because they are technically already divorced. However, the second state may be able to exercise authority over the remaining outstanding issues, such as child custody and support. Therefore, you would have a divorce judgment from one state and a court order regarding marital issues from the other state. The divorce judgment would simply be proof you are divorced and the court order would explain your rights and obligations post-divorce. Saucy and Saucy: In What State Will (Or Should) Your Divorce Take Place? How do I Form an LLC in Various States? A limited liability company, or LLC, is a type of business organization permitted by state statutes. An LLC combines the limited liability of a corporation with the pass-through taxation and flexible reporting requirements of a partnership. To operate an LLC in multiple states, you must choose one state as the “home state” of your LLC and register there as a domestic LLC. After registering as a domestic LLC, you must then register your LLC in other states as a foreign LLC.